280 pages | 46 B/W Illus. Since the development of the first intelligence test in the early 20th century, educational and psychological tests have become important measurement techniques to quantify human behavior. 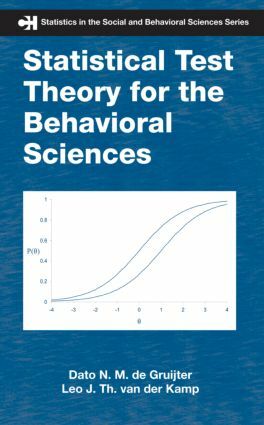 Focusing on this ubiquitous yet fruitful area of research, Statistical Test Theory for the Behavioral Sciences provides both a broad overview and a critical survey of assorted testing theories and models used in psychology, education, and other behavioral science fields. Following a logical progression from basic concepts to more advanced topics, the book first explains classical test theory, covering true score, measurement error, and reliability. It then presents generalizability theory, which provides a framework to deal with various aspects of test scores. In addition, the authors discuss the concept of validity in testing, offering a strategy for evidence-based validity. In the two chapters devoted to item response theory (IRT), the book explores item response models, such as the Rasch model, and applications, including computerized adaptive testing (CAT). The last chapter looks at some methods used to equate tests. Equipped with the essential material found in this book, advanced undergraduate and graduate students in the behavioral sciences as well as researchers involved in measurement and testing will gain valuable insight into the research methodologies and statistical data analyses of behavioral testing. Each chapter contains an Introduction and Exercises.